Camp Shalom - Frequently Asked Questions | Jewish Federation of the Bluegrass, Inc. 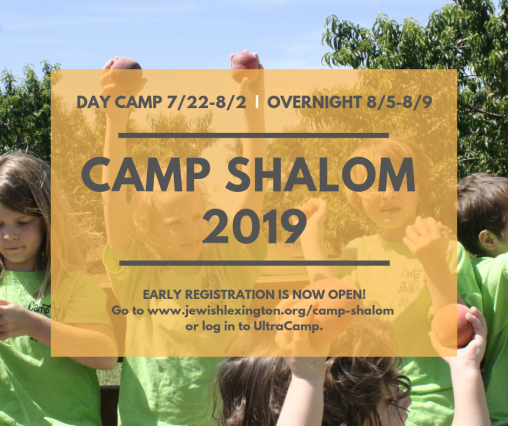 Established in 1968 with the goal of bringing together Jewish kids in central Kentucky for two weeks of fun through an enriching experience. Q: Does Camp Shalom provide snacks? A: Yes. Camp will provide one snack mid-morning and one snack for extended day campers. If your child has a food allergy, please be sure to list this in our medical forms. In the case of severe food allergies, please send your child with a snack that he/she can eat safely. Q: Does Camp Shalom provide campers with lunch? A: No. All campers must bring their own lunch to camp each day. We ask that you pack foods which do not need refrigeration, or provide an insulated lunch bag/box. Please label your child's lunch with their first and last name or initial. Q: Does Camp Shalom have a pool? A: Sadly, no. We are currently renting the facility at Camp Shawano, a property owned and maintained by the Girl Scout Wilderness Council of Kentucky. This is not their main property. However, we have compensated for the lack of a pool with additional water games, small wading pools for the smaller children, and taking the all of the kids to a local pool at least twice per week, weather permitting. Q: Does Camp Shalom offer any discounts? A: Yes. We offer an early registration discount thru April 1, a 15% discount for UK employees, and a $10 sibling discount per session, per sibling. Discounts per child, per session are not to exceed $30. Contact Tamara with any additional questions.